Great news! We got our summer issue of the newsletters mailed today! Nicole Swanson our Director of Education took on this issue wholeheartedly. Steve Fisher, our retired English teacher turned wildlife educator and Don Gibson did the editing. We have a newsletter out without the agonizing stress I went through in the past! I am delighted! It certainly helped that we all were eager to use our new equipment from the E.O. Johnson/Channel 7 technology makeover that we won in May! :) It was like a miracle compared to the work that went into our old method. So, the newsletter is done, edited, printed and mailed as of today! When it arrives in your mailbox let me know what you think. and we will add you to our list, OR you can go to our website and download your own copy there. The copy on line is in full color so that is cool. 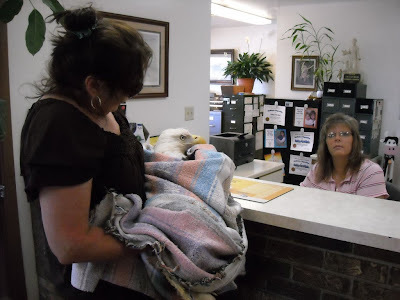 Just as we were doing the afternoon feeding yesterday I found one of our adult Bald Eagle patients that had suffered a wing injury a month ago was in trouble with the wing again. 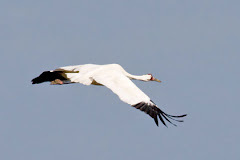 His initial injury was that he was shot in the humerus part of the wing. The part of the wing closest to the body. By the time we got him the injury was several weeks old and necrotic. We cleaned him up and hoped for the best. The wing healed remarkably well and then somehow he re injured the tip of the wing. It is likely nerve damage that just demonstrated itself now. 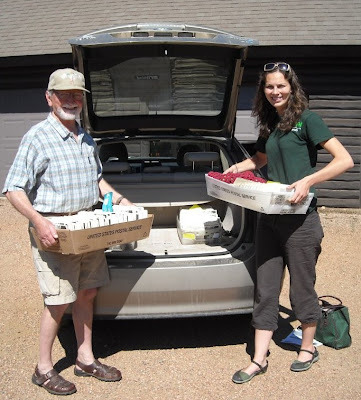 Antigo Veterinary Clinic are wonderful to us and our patients. 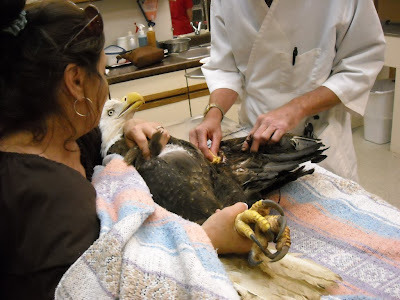 Dr Dennis Bardelmeier washed the eagles new wound. We set up a date for surgery on Monday of next week. 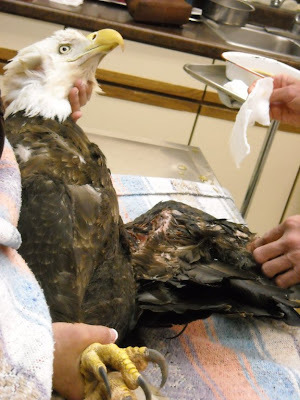 Until then the eagle is on antibiotics. We use antibiotics infrequently with wildlife as it tends to weaken their immune system, but this was one of those times when it is needed. The eagle is back at REGI now and just had his dinner. He is such a great bird and has been so patient thought his ordeal. 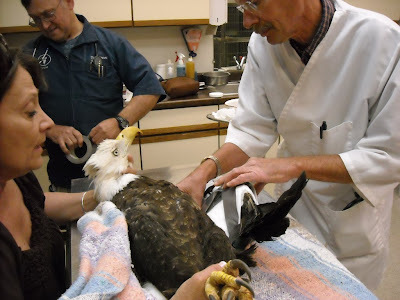 ( Photos: Dr Dennis Bardelmeier cleans the injury on the wing of the Bald Eagle, so he would evaluate if the bird could be saved. Our little American Crow from last night is doing great this morning. The baby birds that were found in the stairwell in Wausau are also doing very well. More updates as I can.